With riding locations for all wind directions, the Cocoa Beach area is a prime destination for traveling kiteboarders. The main riding spot is commonly known as the “520 Slick”. The official name of this park is "Bicentennial Memorial Park". This amazing shallow, flat water spot on the Banana River lies on the South side of the 520 Causeway. Riders setup in the grassy area next to the "Welcome to Cocoa Beach" sign and walk through the opening in the mangroves to launch. Though it can be ridden in any direction, best conditions for "The Slick" is a north wind. This direction is straight off-shore which creates an amazing glassy flat water slick. This is one of Cocoa Beach's most popular riding and learning spots. The water is mostly shallow, except for within the boat channels which are marked with large wooden poles and signs. This makes it an ideal place for lessons with watercraft support. The bottom is a sand/muck combo and most people prefer to wear booties due to some sharp objects that are scattered. There are tons of dolphins, stingrays, and manatees in this area. The park is across the road and a little west of the Cape Canaveral Hospital. People normally set up and walk through an opening just west of the public boat ramp parking. PLEASE LAUNCH FROM THE WATER AND PARK IN PARKING SPOTS PROVIDED AT THE BOAT RAMP!! Cocoa Beach Parking Enforcement does ticket vehicles parked in the grass. Launching and landing from the grassy area can be dangerous due to it's proximity to the road. So please only use this area to set up and then launch/land from the water. PRECAUTIONS: Intermediate to advanced level riding only without boat or instructor assistance. This spot has a very technical launch blocked by mangroves. Use extreme caution if riding this spot when the wind is blowing toward the causeway from the south! An accident can easily result in injury, a deadly car crash or closure of the spot. LAUNCH FROM THE WATER. Foot protection is recommended if planning on walking around for a while. It is deep between the large wooden channel markers. WIND DIRECTIONS: Best from anything with N, NNW, NW to W wind component. But the Slick can be ridden in almost any direction. NE is the gustiest and inconsistent near the launch. It cleans up once you get out on the open water. Good Breeze Kiteboarding offer supervision for a great rate if you feel uncomfortable or just want some local knowledge. Good Breeze Kiteboarding has been offering kiteboarding lessons and equipment in the Cocoa Beach area since 2007. The shallow flat water of the Banana River gives the area an incredible appeal for learning and catching any wind direction. They teach with water-craft support with IKO certified instructors. The “surf town” vibe of Cocoa Beach is really laid back and friendly. 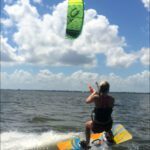 Being central in Florida with close proximity to Orlando and Melbourne, makes the area a killer location for a kiteboarding shop and school. The retail store is across the street from the main Ron Jon Surf Shop on A1A. Located in the Winn-Dixie (Canaveral Plaza) shopping center. It is fully stocked so swing by!